Terry Wallace is one of few people who have played 200 games and coached an AFL team. Wallace was perhaps the best centerman of his era who later transitioned to an elite coach, spending 11 seasons as the senior coach of two clubs. Wallace had a celebrated playing career that included three premierships with Hawthorn and four best and fairest awards, two with Footscray and two with Hawthorn. Although he wasn’t blessed with pace, Wallace was known for his courage in tight and tough contested situations. He was awarded the nicknamed ‘plough’ in recognition of his ability to get in and under packs and rack up possessions. His hard working and passionate approach was carried through to coaching. Wallace took the Western Bulldogs, a team in crisis, to making finals regularly during his six and a half seasons with the team. Highlights of his time with the Bulldogs include two preliminary finals and taking the team from 15th to 3rd between 1996 and 1997. Following his time coaching the Bulldogs, Wallace turned to the media for a new challenge, commentating with Fox Footy, the Herald Sun and 3AW radio. Wallace’s uncanny ability to analyse and explain the modern game has made him a brilliant addition to broadcasts. Wallace returned to coaching in 2005 with the Richmond Football Club, narrowly missing finals in three of his five years at the helm. 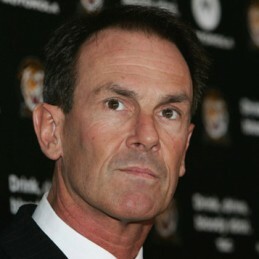 Wallace left the Tigers mid-2009 and became a highly sought after media commentator. He is currently part of the SEN 1116 radio broadcast team, impressing listeners with his insights into the game.